Eight of the Jessie nominations for Pacific Theatre were for the company's production of The Seafarer. Photo by Emily Cooper. It’s a good thing Pacific Theatre programmed The Seafarer well away from the holiday season, for despite its unnecessarily redemptive ending, this Christmas parable may very well have left audiences in a funk through to Easter. Having nothing to do with the sea, The Seafarer takes its name from an Old English poem that is considered a metaphor for the challenges of life and designed to teach Christians of the time to be faithful and maintain their beliefs. In playwright Conor McPherson’s The Seafarer, a similar morality lesson plays out when a guest shows up late in act one to play cards with a group of men on Christmas Eve. In McPherson’s wonderful life, the liquor flows as freely as the f-bombs as a quartet of friends gather on Christmas Eve for their annual poker game, each fighting their own demons. Sharky has just returned home to look after his brother Richard who has recently become blind after falling into a dumpster. Along with the brothers, the card games includes friends Ivan, who has been thrown out on the street by his wife, and Nicky, who has recently taken up with Sharky’s ex. Arriving with Nicky is Mr Lockhart, a devilishly dapper stranger who is about to raise the stakes in the group’s usually friendly game. Despite McPherson’s ability to create realistic characters within a surreal world, by the time we are introduced to Mr Lockhart and realize what really is at stake, there is little sympathy for anyone at the table, but most importantly for Sharky who has the most to lose. Where there should be a gasp at just how high those stakes have become, we are so disconnected from Sharky’s plight that all we can do now is sit on the sidelines and watch how it plays out. Despite the lack of emotional connection to fully draw you into its central story there is still some fine acting going on in this production. As the blind brother Richard, Ron Reed is almost unrecognizable as he fully embraces the confusion of the newly blinded man as much as he embraces his first sip of booze in the morning. Tim Dixon is delightfully buffoonish as Ivan and Andrew McNee brings the necessary aloofness to Nicky. It is in the pairing of John Emmet Tracy as Sharky and John Innes as Mr Lockhart though that director Anthony F Ingram gets his biggest bang. As Mr Lockhart’s identity is revealed late in the first act, the dynamic between them is at times mesmerizing. Set designer Drew Facey effectively transforms the Pacific Theatre space into Richard’s depressing home and sound designer and composer Luke Ertman underscores much of the action with a soundscape that manages to get under your skin without being irritating. 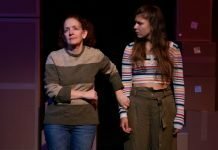 With an opening night that stretched nearly three hours with intermission, ironically The Seafarer is about as long as August: Osage County, the play that won the Tony Award that were both were vying for in 2008. And while it is tempting to recommend this production of The Seafarer for its performances, ultimately I think the better show won out that year. Written by Conor McPherson and directed by Anthony F Ingram, The Seafarer continues at Pacific Theatre through March 29, 2014. Visit http://pacifictheatre.org for tickets and information.